In this stunning book we are going to explore and experience the seasons through the powerful imagery of the haiku poems written by Kobayashi Issa. Kaboyashi Issa was a Japanese poet and Buddhist monk who lived in Japan from 1763 to 1828. Though his haiku were written quite a long time ago, they are just as relevant today as they were when he first set pen to paper. As readers will discover, each haiku captures a special moment in time, bringing it to life and giving the reader a glimpse of something special and precious. We watch as a year unfolds for a little family and how their lives are changed as the time passes. This collection begins by looking at spring days. We see how village life begins to revive "Once snows have melted." We watch as an old man tries to untangle a kite which has wrapped itself around a blooming cherry tree. We watch a little girl reading as she lies in a patch of quiet patch of sunshine. In the summer we watch as a day unfolds, from the moment when a boy and his father and his grandfather "watch dawn/over green fields," to the moment when two people stand under the night sky where "the stars/are whispering to each other." For the fall we have a new set of images and ideas to experience. Now the greens have changed to golden yellows and the little cherry trees are bare. Like the seasons, the old grandfather is slowly running down. Finally there is winter and the first snow is on the ground. Children watch a goose stand on the snow beneath the empty branches of a willow tree. Their grandfather is gone but he is not forgotten, and when spring returns someone new will sit in his chair under the cherry tree. Children will not only get to watch the seasons change but they will also follow the fortunes of this close little family. Though their loss is sad, the family's story has its joyous moments too and we can see how the young raise up to take the place of the one who has gone. 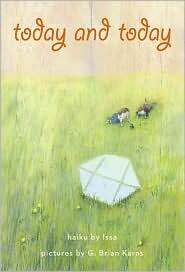 With lovely emotive illustrations rendered in a variety of media, this book is a real treasure to look at and to read. Using his lovely art G. Brian Karas has brought some beautiful poetry to the attention of a new young audience. Surely the poet would be very pleased with this tribute to his work.